Pipette.com offers the Buy 1 BrandTech Transferpette S Multichannel Pipette and Get 1 Case of BRANDplates for FREE. This promotion will benefit those seeking to replenish their plate inventory. Pipette.com announces their latest promotion on the BrandTech Transferpette S Multichannel Pipette. BrandTech Transferpette S is designed for research and routine laboratory applications due to its lightweight and ergonomic construction. BrandTech® Scientific manufactures high quality liquid handling products, life science plastics, and plastic labware which includes pipettes, pipette tips, repeaters, bottletop dispensers, plates, and tubes. The BrandTech Transferpette S Multichannel Pipette is available in 8- and 12- channel models. It is 15% lighter than its predecessors and is equipped with V-rings for low force tip mounting and ejection. Transferpette S Multichannel has a 12 mm piston stroke-length which is the shortest of all leading pipettes. 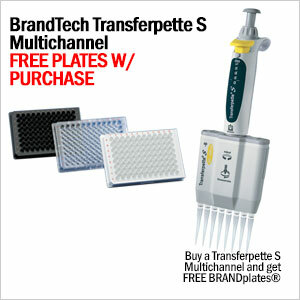 The BrandTech Transferpette S Multichannel Pipette promotion allows customers who purchase the pipette to get a free case of BRANDplates. Pipette.com is a leading distributor of pipettes, pipette tips, tubes, plates, and lab equipment. They are also operate the largest independent calibration facility on the West Coast. Pipette.com is solution oriented and is dedicated to finding the right solution for customers in the life science community. Questions, concerns, and other inquiries can be addressed to the company directly.